Covered porch with swing where you can gaze at the stars, listen to birds sing, and perhaps see deer! Kitchenette to keep your beverages cold & microwave for your convenience. Even free WIFI so you can post your favorite pics to Facebook! These one bedroom, one bath, romantic honeymoon cabins in the woods are rustic on the outside and beautiful on the inside. All 10 of these cabins were built at the same time so they are all very much alike. One King or Two queen size beds. 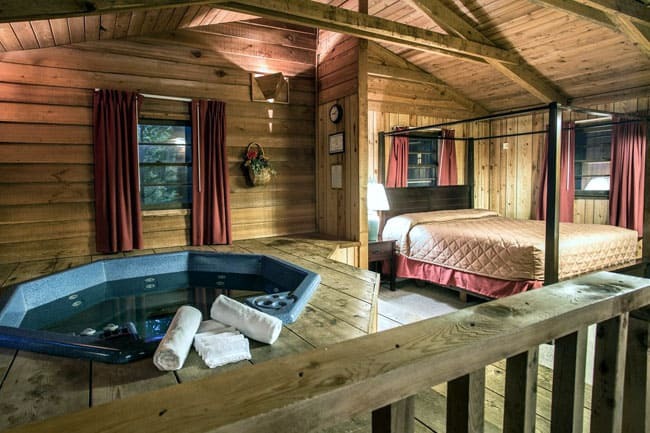 350 gallon hot tub next to the bed. Each cabin is a little different in layout and decor as they were built at different times. Approximate size 700 sq. ft. Specific cabins cannot be guaranteed but we will do our best to accommodate your request. A less expensive version of our Countryside Romance cabins, as these have not yet been fully upgraded. Most have new furniture and/or flooring and are in various stages of upgrades. 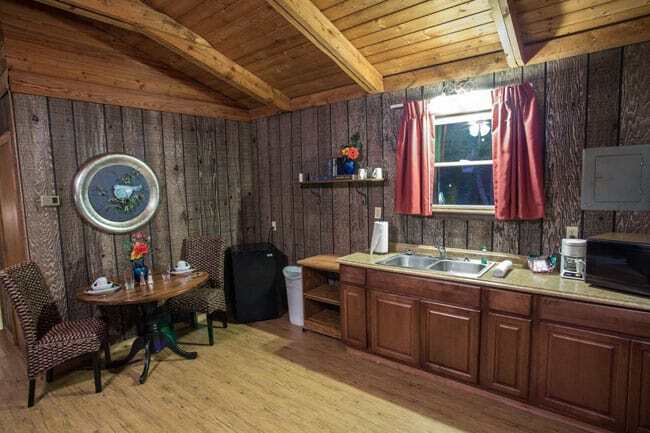 Once the renovation is completed, the cabin is moved to the “Countryside Romance” category. Enjoy the savings while they last!